The Austin Allergy Machine Junior was designed specifically to provide economical relief for allergy and asthma sufferers. In addition to featuring a medical-grade true HEPA filter to remove common airborne allergens including dust mites, pollen, mold spores, and pet dander, it includes an innovative High Efficiency Gas Absorption (HEGA) filter. Developed by the British military for use against chemical warfare, HEGA carbon cloth filtration is found exclusively in the Austin Allergy Machine air cleaner series. 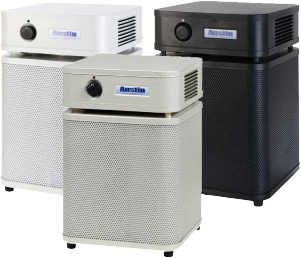 The Austin Allergy Machine features a 4-stage filter system including 2 pre-filters, medical-grade HEPA, and the HEGA filter. The HEPA filter is capable of removing more than 99.97% of all particles greater than 0.3 microns in size and approximately 95% of particles down to 0.1 microns. Austin Allergy Machine Junior works best in rooms up to 225 sq ft.